Comprising a range of useful filters for outdoor photography, the Vu Filters 49mm Sion Circular Polarizer and Solid Neutral Density Filter Kit from B&H bundles the slim circular polarizer filter with 1-stop, 2-stop, 3-stop, and 10-stop solid neutral density filters. Additionally, a filter pouch is included for storing and protecting the filters when not in use. The 49mm Sion Slim Circular Polarizer Filter from Vu Filters helps to reduce reflections and glare by filtering out light that has become polarized due to reflection from a non-metallic surface. The light from the sun naturally becomes partially polarized due to reflecting off electrons in air molecules, causing the light to scatter into what appears as haze. A polarizing filter arranges, and filters, this directionally polarized light perpendicularly to the reflected light, allowing for the absorption of much of this light. This results in a noticeable reduction of glare and reflections from non-metallic surfaces and an increase in the saturation of skies and foliage. This 49mm Sion Slim Circular Polarizer Filter's ring assembly is 3.4mm thick, to help maximize vignetting prevention. It can be rotated in order to adjust the intensity of the polarization effect, and features side knurling to provide a more textured grip for mounting or removing the filter from a lens. The 49mm Sion Solid Neutral Density 3.0 Filter from Vu Filters is an ND filter with a 1,000x filter factor that provides a 10 stop exposure reduction. Its 3.0 density creates a darkening of the entire image, allowing you to photograph with a wider aperture or slower shutter speed than normally required. By slowing your exposure time or increasing your aperture, you are able to control depth of field and convey movement more easily. Neutral density filters do not affect the coloration of the image and are ideal for pairing with other filters. To prevent internal ghosting and reflections, each glass surface includes seven layers of anti-reflection coating. This multi-coating also offers greater protection to the filter substrate and helps it to stay clean for longer than with uncoated filters. The Flat Wave Overcoat associated with this Sion solid neutral density filter provides an additional eighth layer over the multi-coatings on the front side of the filter, resulting in an improved beading effect to repel water for greater cleaning efficiency. This Sion solid neutral density filter is constructed from Schott glass for optical clarity as well as color fidelity and features an aluminum-alloy filter ring for durability while remaining lightweight. Each glass surface includes seven layers of anti-reflection coating to prevent internal ghosting and reflections. The 49mm Sion Solid Neutral Density 0.3 Filter from Vu Filters is an ND filter with a 2x filter factor that provides a 1 stop exposure reduction. Its 0.3 density creates a darkening of the entire image, allowing you to photograph with a wider aperture or slower shutter speed than normally required. By slowing your exposure time or increasing your aperture, you are able to control depth of field and convey movement more easily. Neutral density filters do not affect the coloration of the image and are ideal for pairing with other filters. 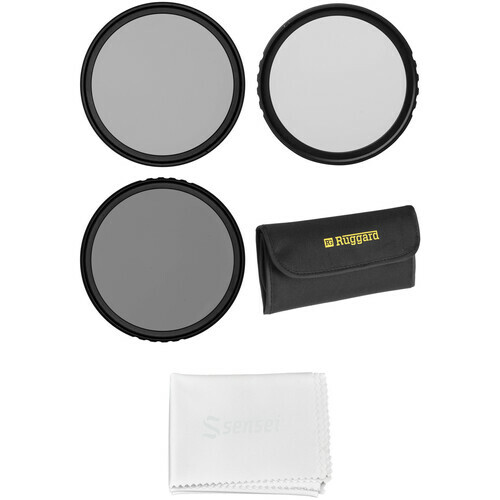 The 49mm Sion Solid Neutral Density 0.6 Filter from Vu Filters is an ND filter with a 4x filter factor that provides a 2 stop exposure reduction. Its 0.6 density creates a darkening of the entire image, allowing you to photograph with a wider aperture or slower shutter speed than normally required. By slowing your exposure time or increasing your aperture, you are able to control depth of field and convey movement more easily. Neutral density filters do not affect the coloration of the image and are ideal for pairing with other filters. The 49mm Sion Solid Neutral Density 0.9 Filter from Vu Filters is an ND filter with an 8x filter factor that provides a 3 stop exposure reduction. Its 0.9 density creates a darkening of the entire image, allowing you to photograph with a wider aperture or slower shutter speed than normally required. By slowing your exposure time or increasing your aperture, you are able to control depth of field and convey movement more easily. Neutral density filters do not affect the coloration of the image and are ideal for pairing with other filters. The black Six Pocket Filter Pouch from Ruggard holds six filters with a diameter of up to 72mm inside six mesh slip pockets. For security, the padded pouch neatly folds and features a touch-fastened closure at the edge. A white, business card sized paper inside a clear filter ID sleeve at the back of the pouch allows you to mark and identify the filters you have inside. Note: Designed to fit filters of average thickness. When used with certain thicker filters (e.g. circular polarizers, graduated ND, etc.) the pouch might not close fully. Box Dimensions (LxWxH) 3.386 x 3.307 x 0.551"
Box Dimensions (LxWxH) 6.063 x 2.835 x 1.181"